Sen. Elizabeth Warren, D-Mass. (right), a member of the Senate banking committee, and Rep. Maxine Waters, D-Calif., ranking member of the House financial services committee, express their outrage to reporters that a $1.1 trillion spending bill that was passed in Congress contains changes to the 2010 Dodd-Frank law that regulates complex financial instruments known as derivatives. Sen. Elizabeth Warren failed to stop a change in bank regulations last weekend, but she raised her profile yet again. The Massachusetts Democrat tells NPR that her fight over a provision in a spending bill was a "warning shot." She intends to continue her fight against what she describes as the power of Wall Street, even though that fight brought her to oppose leaders of her own party. 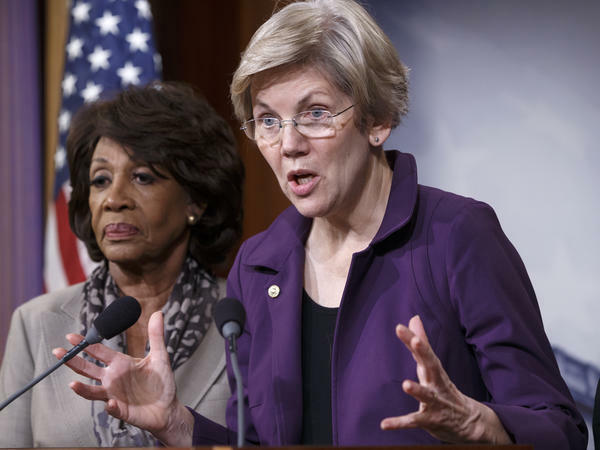 In recent weeks, Warren challenged one of President Obama's nominees to a senior post at the Treasury Department, arguing that he was too close to powerful banks. Then, last week, she denounced a $1.1 trillion spending bill that had been passed by the House and approved by Senate leaders as well as Obama. Warren, a hero to many among her party's liberals, objected to a provision that would undo a new financial regulation. "Republicans slipped in a provision at the last minute that would let derivatives traders on Wall Street gamble with taxpayer money and then get bailed out by the government when their risky bets threaten to blow up our financial system," she told NPR. The measure involves complex financial trades called derivatives that can be hugely profitable but also hugely risky. A provision of the Dodd-Frank law required banks to create subsidiary companies to do their trading — with their own money. The idea was to create a firewall between the banks' trading and customers' deposits, which are federally insured. The spending bill that the Senate passed over the weekend eliminates the new rules, and keeps financial trading within the banks. NPR's Steve Inskeep spoke with Warren about the financial provisions in the spending bill, challenging her party's leadership and calls for her to run for president in 2016. Editor's note: Some earlier comments on this post were inadvertently removed when it was moved to a different URL. Those comments can be viewed here. You said they slipped it in, which is true — it did get tacked on to this much larger legislation about something else. But isn't this a provision that did go through the regular legislative process in the House of Representatives? There were committee hearings. There were Democrats as well as Republicans who voted for it. You know, it was literally never introduced in the Senate. It had no hearings. There was no discussion about this. And let's keep in mind about this provision, this is a provision that Citigroup lobbyists literally wrote. And then, just to make sure that everybody got the point, Jamie Dimon, the CEO of JPMorgan, personally made phone calls to House members to push for this change. I think that tells you what was really going on here. They want to be able to juice their profits. A half-dozen of the largest financial institutions in this country want to be able to take riskier bets, and, hey, if it doesn't work out, they want the U.S. taxpayer to bail 'em out. I think that's a bad idea. You mentioned that current bank executives wanted this change. But they were able to point out that over the years — there have been years of debates about this very rule — over the years that people who have thought this change would be OK have included Paul Volcker, the former chairman of the Federal Reserve, who's widely respected. He is on record as long ago as 2010 saying that other parts of banking regulation take care of this issue and this seems to be needlessly complicating things. I think that it's fair to say that this is a very complicated provision and that it was a compromise when it was put in. My view on it, however, is that we should have something stronger here, not that we should just knock it down and get rid of a provision that's designed to prevent government bailouts. Isn't it true that whether the government directly insures the transaction or not, the government sort of is? Because these are institutions regarded as too big to fail. We're going to bail them out if they fail anyway. Well, you know, that is the risk we run right now, is that we have a handful of giant banks in this country that were too big to fail in 2008, got bailed out by the taxpayer and are now bigger than they were then, and are again loading up on risks. But, you know, whichever way you think is the right answer here, I know for sure that this shouldn't be slipped into an omnibus spending bill — a bill that must pass in order to keep the government open. And what it means, if this works, is they can just kinda keep slipping grenades and attach them to, you know, must-pass spending bills, and pretty soon we have no financial regulations at all. Sen. Warren, some people will know that you challenged your party's leadership on this shortly after your party added you to the Democratic Senate leadership. How did it work in this very early case in which you disagreed with the leadership? Look, these are issues I've worked on for most of my career. I am glad to be in leadership, I am grateful to have a, a place at the table, but my priorities haven't changed. I'm gonna stand up and fight for what I believe in. Well, what does it say about your party that the party leadership in the Senate and apparently elsewhere, including the White House, was not with you on this? You know, actually, I want to say that differently. You know, the president said he was very much opposed to this provision. There were a lot of Democrats who were opposed to this provision. You know, once the House passed an omnibus bill with this in it and threw it over to the Senate — and then the House left town — at that point, there was very little choice but either to pass the omnibus, even with this thing in it, or shut down the government. And we didn't want to shut down the government. Sen. Warren, as you must know, that even as you were fighting over this in the Senate, there was a group called Ready for Warren that wants you to run for president, that released a letter signed by more than 300 people who describe themselves as former Obama campaign workers and staffers and aides. They want you to run. What do you say to them? I'm, I'm not running for president. That's not what we're doing. We had a really important fight in the United States Congress just this past week. And I'm putting all my energy into that fight and to what happens after this. Would you tell these independent groups, "Give it up!" You're just never going to run. I told them, "I'm not running for president." You're putting that in the present tense, though. Are you never going to run? I am not running for president. You're not putting a "never" on that. I am not running for president. You want me to put an exclamation point at the end? (Laughs) OK, that's fine. Can you tell me, Senator, how you see your role over the next couple of years presuming that you don't run? You've raised your profile in a way that few Democrats have been able to do recently. You know, I'm just here to stand up for hardworking families who just want a fighting chance. That's what I'm in this fight for, and I'm in this fight all the way. The government opens this week after a dramatic weekend. The Senate approved a spending bill despite protests from the left and from the right. The Democrat we hear from next fought hard against changes to banking regulations. Senator Elizabeth Warren spoke with our colleague Steve Inskeep. STEVE INSKEEP, BYLINE: She's among this moment's most prominent Democrats. She was a watchdog overseeing the bailout of the financial industry. More recently, Senator Warren has hammered both parties and the White House for being too close to Wall Street. So people noticed when she fired up many Democrats against one provision in this giant bill. SENATOR ELIZABETH WARREN: Republicans slipped in a provision, at the last minute, that would let derivatives traders on Wall Street gamble with taxpayer money and then get bailed out by the government when their risky bets threaten to blow up our financial system. INSKEEP: The measure involves complex transactions by banks. They perform hedges, or swaps, which can smooth out risk in the market or become risky bets themselves. The measure passed over the weekend eliminates the new rules and keeps the transactions federally insured. WARREN: The provision that just got repealed is entitled Prohibition Against Federal Government Bailouts Of Swap Entities. I mean, that's what this is really all about. INSKEEP: With that said, you said they slipped it in, which is true. It did get tacked on to this much larger legislation about something else. But isn't this a provision that did go through the regular legislative process in the House of Representatives? There were committee hearings. There were Democrats, as well as Republicans, who voted for it. WARREN: You know, it was literally never introduced in the Senate. It had no hearings. There was no discussion about this. And let's keep in mind about this provision - this is a provision that Citigroup lobbyists literally wrote. And then, just to make sure that everybody got the point, Jamie Dimon, the CEO of JPMorgan, personally made phone calls to House members to push for this change. I think that tells you what was really going on here. They want to be able to juice their profits. A half-dozen of the largest financial institutions in this country want to be able to take riskier bets. And, hey, if it doesn't work out, they want the U.S. taxpayer to bail 'em out. I think that's a bad idea. INSKEEP: You mentioned that current bank executives wanted this change. But they were able to point out that over the years - there have been years of debates about this very rule - over the years that people who have thought this change would be OK have included Paul Volcker, the former chairman of the Federal Reserve, who's widely respected. He is on record as long ago as 2010 saying that other parts of banking regulation take care of this issue and this seems to be needlessly complicating things. WARREN: I think that it's fair to say that this is a very complicated provision and that it was a compromise when it was put in. My view on it, however, is that we should have something stronger here, not that we should just knock it down and get rid of a provision that's designed to prevent government bailouts. INSKEEP: Isn't it true that whether the government directly insures the transaction or not, the government sort of is because these are institutions regarded as too big to fail? We're going to bail them out if they fail anyway. WARREN: Well, you know, that is the risk we run right now, is that we have a handful of giant banks in this country that were too big to fail in 2008, got bailed out by the taxpayer and are now bigger than they were then and are again loading up on risks. But, you know, whichever way you think is the right answer here, I know for sure that this shouldn't be slipped into an omnibus spending bill - a bill that must pass in order to keep the government open. And what it means, if this works, is they can just kind of keep slipping grenades and attach them to, you know, must pass spending bills. And pretty soon we have no financial regulations at all. INSKEEP: Senator Warren, some people will know that you challenged your party's leadership on this shortly after your party added you to the Democratic Senate leadership. How did it work in this very early case in which you disagreed with the leadership? WARREN: Look, these are issues I've worked on for most of my career. I am glad to be in leadership. I am grateful to have a place at the table, but my priorities haven't changed. I'm going to stand up and fight for what I believe in. INSKEEP: Well, what does it say about your party that the party leadership in the Senate and apparently elsewhere, including the White House, was not with you on this? WARREN: You know, actually, I want to say that differently. You know, the president said he was very much opposed to this provision. There were a lot of Democrats who were opposed to this provision. You know, once the House passed an omnibus bill with this in it and threw it over to the Senate - and the House left town - at that point, there was very little choice but either to pass the omnibus, even with this thing in it, or shut down the government. And we didn't want to shut down the government. INSKEEP: Senator Warren, as you must know, that even as you were fighting over this in the Senate, there was a group called Ready for Warren that wants you to run for president, that released a letter signed by more than 300 people who described themselves as former Obama campaign workers and staffers and aides. They want you to run. What do you say to them? WARREN: I'm - I'm not running for president. That's not what we're doing. We had a really important fight in the United States Congress just this past week and I'm putting all my energy into that fight and to what happens after this. INSKEEP: Would you tell these independent groups give it up? You're just never going to run. WARREN: I told them I'm not running for president. INSKEEP: You're not putting a never on that. WARREN: I am not running for president. Do you want me to put an exclamation point at the end? INSKEEP: (Laughter) OK, that's fine. Can you tell me, Senator, how you see your role over the next couple of years presuming that you don't run? You've raised your profile in a way that few Democrats have been able to do recently. WARREN: You know, I'm just here to stand up for hard-working families who just want a fighting chance. That's what I'm in this fight for and I'm in this fight all the way. INSKEEP: Senator Elizabeth Warren of Massachusetts, thanks very much for the time. WARREN: Thank you. Transcript provided by NPR, Copyright NPR.